The story and setting of Françoise Mallet-Joris’ House of Lies might have come straight out of a Simenon novel. The narrative concerns a wealthy brewer, Klaes van Baarnheim and his disagreeable, scheming relatives. Unbeknown to van Baarnheim, he has not long to live and his extended family bicker over the fate of his fortune and openly bemoan his refusal to die. Central to the plot is van Baarnheim’s illegitimate daughter, Alberte, whom the brewer has taken into his home. As van Baarnheim lavishes an increasing amount of time and money on Alberte, and seems about to ‘acknowledge’ her, the family become increasingly anxious for van Baarnheim to expire before he can disinherit them. Tramps were sleeping here and there among the warehouse crates, sprawled in strange postures, occasionally flinching and quivering like sick dogs. A few stray cats prowled round the closed fishmongers’ stalls, licking the pavement where lingered bits of crushed flesh or traces of blood. A fog hovered round the electric pylons, the black hulls of boats, the tall house fronts, the warehouses with black doors rising one above the other opening out upon the void…The little cafés were lighting up, corrugated steel blinds were being raised with dramatic flourish. It is from the Triangle that Alberte comes. Her mother is an ex-prostitute, now alcoholic and on the verge of madness. Van Baarnheim, anxious to avoid a stain on his reputation, attempts to pay her to move away, but she, like her daughter, is stubborn and refuses. Alberte is an aloof, level-headed girl, who remains distant from the bickering and scheming of the clan. She is resolutely unmoved by the expensive restaurants her father takes her to, and only moderately impressed when he shows her round the brewery ­– clearly as a precursor to putting her in charge. Each plunged into the deepest silence of the soul. This lasted for a very long time, without beginning or end, an infinite time of despair and peace. She had thrown a shawl around her shoulders in the way many women of the quarter did . . . She resembled them all. And was she not one of them? 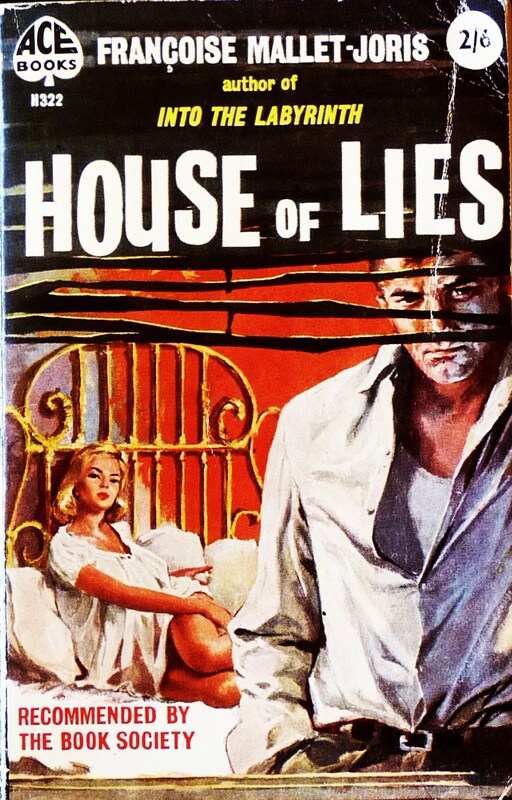 It’s to Mallet-Joris’ credit that the merit or otherwise of Alberte’s decision is left ambiguous, and, in the end, it is this, along with the vivid descriptive writing, that makes House of Lies worth reading. First published in 1956 as Les Mensonges. Translated by Herma Briffault. Ace Books edition published 1960.